Abang Johari (front centre), Abdul Karim (third right) and Francis (third left) with other leaders after the committee meeting. 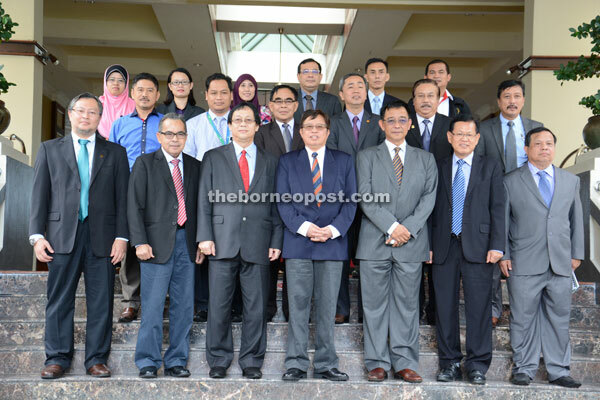 MIRI: The state government is confident of achieving the zero squatter target by 2020 through the numerous measures in its zero squatter blueprint for 2016 to 2020, said Housing Minister Datuk Amar Abang Johari Tun Openg. He added that the state had succeeded in reducing the number of squatters by almost 30 per cent from 9,760 in 2010 to 7,036 by end of 2014, with Miri having the highest number followed by Kuching and Bintulu. “The decline was due to various short-term and long-term strategies carried out like the People’s Housing Project (PPR) which has two schemes, namely houses for rental and houses for purchase,” he said after chairing the first meeting of the State Squatter Management and Solving Committee here yesterday afternoon. The meeting was attended by, among others, assistant ministers of housing Datuk Abdul Karim Rahman Hamzah and Datuk Francis Harden Hollis, Assistant Minister of Communication Datuk Lee Kim Shin, Sibuti MP Ahmad Lai Bujang and Lambir assemblyman Ripin Lamat. Abang Johari also disclosed that the government had adopted three effective measures to achieve the goal of zero squatters in the state – Public Housing Project (PPR) for rental, new housing settlements and houses for purchase, with payment and measures set by the ministry. “The government also gives the option to those who rent PPR unit through the ‘Rent-to-Own’ scheme where the tenant will eventually own the unit,” he added. He also attributed the reduction in number of squatters to the collaboration with National Housing Department, Land and Survey Department and other related ministries in the state. “In the near future, we also plan to identify several areas in the whole state for communal reserve land with infrastructure development including water and power supply with the cooperation of Land and Survey Department,” he added. Meanwhile, he disclosed that the number of squatters living on state land in Miri was reduced by 20 per cent in 2014, from 4,542 in 2010 to 3,837. He also said both Kuching and Bintulu recorded a reduction of 30 per cent in the number of squatters from 2010 up to 2014. “Thus by 2020, the state will hit its target of zero squatter,” he added. This year, the National Housing Department will build 1,234 units of houses under the PPR project in seven locations – PPR Sungai Tengah, PPR Petra Jaya, PPR Sri Aman, PPR Saratok, PPR Tabuan Melayu (Phase 1), PPR Samarahan and PPR Lambir, Miri, he added. Under the 11th Malaysia Plan, he said the state Housing Ministry had proposed to the federal government to build 28 PPR projects with a total of 13,232 units in Sarawak to meet the demand for housing, including from squatters.